Millions of homeowners are discovering ductless mini split systems as an answer to their home's heating and cooling issues. If mini splits are the answer, then controllers are the key to unlocking their full potential of efficiency and adaptability in your home. Better control over your home's heating and cooling equipment means better comfort for you. Controls are essential for older homes retrofitted with zoned systems, and, with the right control strategy, you can easily transform problematic rooms like attics, sun-rooms, and additions into perfectly-tempered retreats with the convenience of integrating into your home's existing systems. Getting the perfect controller doesn't just give you a better-performing mini split system, but one that's easier to use and tailored specifically to your preferences. 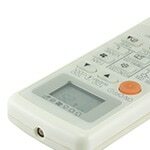 Similar to a computer keyboard or mouse, an HVAC controller is a device that allows you to communicate with your equipment. These devices range from simple handheld remotes with basic functions to complex wireless devices that you can control even from your smartphone! Sensors inside each indoor unit call for cooling, heating, or de-humidification, depending on your desired comfort setting. 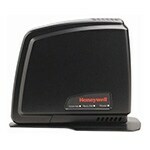 Energy-saving inverter technology will then maintain that comfort level. Sure, mini splits are one of the most energy-efficient solutions, but it's the controllers that give you the ability to fully customize your home's comfort. Like a maestro conducting a symphony, controllers can seamlessly direct multiple indoor units and allow you to supplement existing equipment like a furnace or boiler. A ductless mini split, paired with the right controller, will give you the power to harness its true potential. As we move down the list, each type will give you more options, flexibility, and automation. More often than not, people are surprised to learn that their indoor units do not come with a "smart thermostat" out of the box. Instead, a hand-held controller is included. Like your TV remote, these controls let you communicate with one indoor unit at a time in the same room. You're able to manually control the unit by turning it on or off, setting the thermostat (to cool or heat), and controlling the airspeed and vane direction. Some models may even feature timers and sensors that will promote better comfort and convenience. If you have a single-zone mini split unit for a seldom-used room, then a standard controller may be all that you need. But, for an array of multiple indoor units, you're going to want an easier way to control them from a single source. If you are looking to install a larger mini split system with multiple zones, you'll quickly learn how much trouble it is to manually control each individual unit! 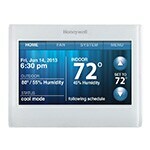 Programmable thermostats maintain a standard controller's functionality while featuring automated daily settings. These controllers let you pre-program your desired temperature ranges for a given day, and they "tell" the connected unit(s) when and for how long to run based on the parameters you've previously set. Just be sure you choose a programmable controller that is the same brand as your mini split system; otherwise, it won't be able to communicate directly with the indoor units without first connecting to an adapter. Pro Tip: If you're wondering which products will work with your mini split system, manufacturers publish compatibility charts that you can easily download from our product pages under the "manual" tab. Smart thermostats, like ecobee and Nest, go beyond mere scheduling to include features like real-time weather notifications and predictions that can automatically adjust the system's settings. They can also 'remember' and 'learn' your comfort preferences and anticipate your settings based on the time of day, whether you're just waking up in the morning, coming home from work, or going to bed at night. Other smart thermostat features include multi-zone sensors that can detect occupancy and humidity, and the ability to connect home security devices like cameras and smoke/CO sensors. You can even receive home safety alerts directly to your phone if the temperature reaches dangerous levels for pets or gets so cold that your pipes are at risk of bursting. Though they are intelligent, smart thermostats don't always work well with mini split heat pumps and may be more expensive and complex to install than alternatives. For each indoor unit, you'll need to install a smart thermostat paired with a thermostat adapter (sometimes called a dry contact) so they can communicate with each other. You may also experience reduced functionality like not being able to adjust the fan speed, vane direction, or control humidity. People may be mesmerized with smart thermostats, but if you want to be in the driver's seat and take your home's comfort to the next level without the added cost and confusion, installing a Wi-Fi adapter is your ticket. 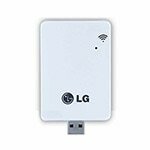 Due to their ease-of-use and low cost, WiFi adapters are easily one of the best control solutions on the market. 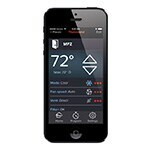 They retain the functionality of a programmable thermostat without sacrificing the convenience of smart technology. 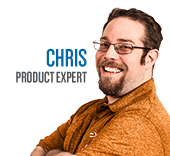 WiFi adapters are brand-specific, yet simple to install and use. They connect directly to each indoor unit, enabling you to control all of the indoor units from your mobile device, tablet, or computer. If you're thinking about supplementing your existing forced-air or boiler system with a Mitsubishi mini split, you may consider getting RedLink controllers that will bring all of your equipment together. Without having to manually run two or more separate devices, you can control everything from one central controller or smartphone, making your life easier! By installing integrated controls, your mini split can also supplement your home's heating and cooling equipment, saving you money on energy costs by utilizing inverter technology. Now that you have an understanding of what controls are and what they allow you to do, you'll be able to build a robust comfort strategy with complete confidence. If you want more information about how to build a custom comfort system you will be proud of, contact our experts today! How to Get Control of Your Mini Split System - Mini Split HVAC Thermostats and Controls. Our heating, ventilation and cooling equipment how-to library can help you pick the perfect comfort solution for your home.